Indian Railway is world’s largest human transport system, is currently dealing with a lot of problems, such as availability of confirming seat if available during immediate cancellation / getting down at destination where other waiting list passesnger from that destination can board a train and reach the destination to avoid not allowing the other people who enter the train without buying tickets and then buy tickets from tc, reduce the burden of passenger to carry ticket. However there is no such system that presently in Indian railway gives accommodation to waiting list passengers during their journey and reducing the burden of carrying tickets. 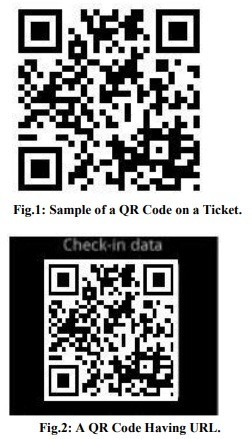 This paper proposes the new Seat Allocation system considering the advantage of QR code image that containts information about ticket and passenger info in form of 2d . Moreover, authentication seat allocation checking by tc is done using an another android app for tc which verifies qr code information with the database and reduces the burden of tc. Through this research paper our approach is to make journey of waiting list passengers more convenient in Indian Railway. Indian Railway is India’s third largest human transport system over which 2 crore  passengers travel daily all over India. Even if there are seat available random people who don’t buy tickets enter the compartment and buy tickets from the tc. Due to this, peak seasons take place and more than half of the passengers having tickets of waiting suffer. These waiting list passengers accomplish their journey from their source station to destination in standing mode. The number of passengers in Indian Railway has been increasing drastically in every year, in a rate of 25 to 50 percent from its previous year. Such increase also increases the number of waiting list passengers in every train. Increasing number of waiting list passengers, increase rushes in train which results “happy journey” slogan of Indian Railway in to “unhappy journey”. There are forms of qr code ie 2d,3d,4d etc as the dimention increases process time and scanning time increases to avoid this we make use of qr code 2d image which reduces the time of scanning and makes the work of tc much faster. 1. Smart way to scan ticket through QR code. 2. Chart system of checking is eliminated. 3. Check-in, Check-out, on-spot booking procedure. 4. Dynamic seat allocation for waiting list passengers. 5. SMS Alerts are sent to the mobiles. The dynamic seat allocation system is the proposed model which is helpful to Indian Railway in many ways. Check-in for all the boarded passengers. If anyone willing to discontinue the journey then check-out procedure will be followed that gives the vacant seat information to the PRS and PRS will allot this seat to a non-confirmed passenger informing by an SMS. In TTE’s device there will be 3 interfaces as follows. Our proposed DSA model is divided in the following submodule. (A) Little modification in current Passenger Reservation System. (B) Check-in, Check-out and Booking procedure. (C) Automatic up gradation procedure. Today PRS is available at 8000 counters more than 2380 locations throughout the countries, including all major stations, and important non-railhead locations such as tourist centers and district head quarters. The PRS services are available to passengers for 23 hours in a day. Passengers can reserve a berth for any train 120 days in advance. In addition to the railway counters, multiple delivery channels have been provided to Rail passengers to access the PRS services. I-Ticketing and Eticketing and through Internet was launched in year 2002 and 2005respectively. Booking through Post offices was launched in year 2007 . Besides all these facilities provided by Indian Railway one attempt that was tried to make is to reduce the usage of paper as much as possible. Passengers are requested to use their Mobile Phones as journey tickets, because the ticket is stored in Mobile Phone either as an SMS sent by IRCTC or in the PDF format store in memory card in the case of e-ticket. A. xyz.in: server site of Indian Railway. B. nr: Northern Railway of Indian Rail network. C. c4Lj9gM: Passenger Specific unique Code randomly generated. It is same as user id of various mail servers. A. Obtain the reservation ticket either confirm or waiting with the QR-code print over the ticket. B. In the case of mobile phone ticket QR Code image is sent to the multimedia handset of Passenger. If the Passenger does not have any multimedia handset, he must take printout of the ticket. A. TTEs make a request to passenger to show his ticket. B. Passenger places his Mobile Phone or ticket in his hand near Hand Held Terminal of TTEs to read QR barcode for check-in as shown in figure 2. C. A TTEs uses application of his Android HHT to read the QR Code over the ticket or from the screen of passenger’s phone and verifies it. 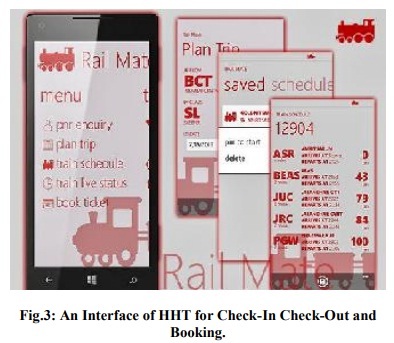 D. Application of HHT give the URL after decoding information from QR Code, this URL helps the TTEs to login in PRS server to extract the information in respect of passenger. E. The information obtained from PRS is then matched with the ticket of passenger. If the information matched along with any identification proof carried by passenger then the TTEs will push the button of check-in shown in the figure below to make an entry of the presence of passenger to the DSA server. A. TTE press the check-out interface and scan the QR code. B. HHT redirects to PRS server and fetch the passenger detail. C. TTE authenticate the passenger with the Information provided by PRS server and press OK . This is used when a passenger is boarded in the train without ticket. A. TTE press the Booking interface in HHT and its camera is switched on to take a snap of passenger or her ID card or her photograph. B. Enters her name and journey detail. C. After payment ticket is booked and she is authorized to travel in the train. Above three procedures can be accomplished through the TTEs, HHT device whose interface is shown in Figure 3. A. Now the check-out procedure is done automatically by the DSA system when the passenger completes his journey and leaves the train. B. But if the passenger left the journey in-between due to his personal reason then the TTEs will check-out to give the information to DSA for dynamically allocation of seat. Now from here the job of the TTEs finishes after checking both confirm and waiting list passengers who are in the train. 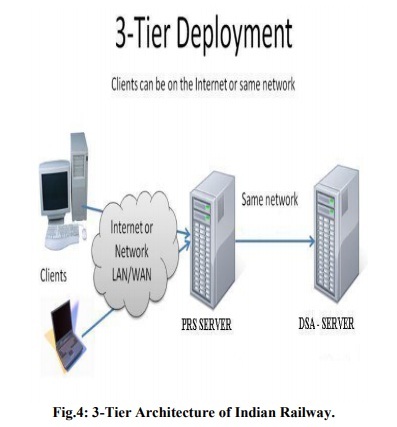 C. Automatic Upgradation Procedure The automatic up gradation procedure of DSA server of Indian Railway makes the Reservation system dynamic. It means that now it is possible to make the reservation when the train is running. This up gradation policy gives the transparency in berth or seat booking either through online or from the counter. Here we have suggested one more server to be installed parallel to the PRS server, situated at five different cities such as New Delhi, Mumbai, Kolkata, Chennai and Secunderabad. The DSA Architecture is based on 3-tier client-server distributed transaction paradigm as shown in Figure 4. 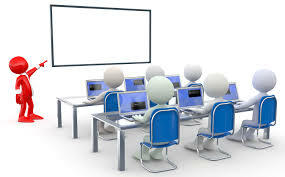 The system has distributed architecture with 5 server clusters placed in server centers in five cities: Mumbai, New Delhi, Kolkata, Chennai and Secunderabad along with the PRS server. 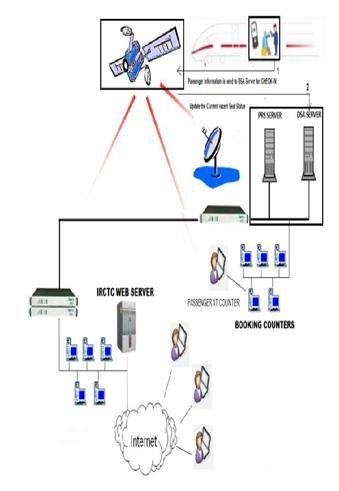 The server clusters are connected together by a core network based on a mesh of 02×02 Mbps leased lines using RTR (Reliable Transmission Router) as middleware. Availability of seat on train when it is running is depends upon the following policy. A. First the berth is provided to waiting list passengers who are on the train and only those waiting passenger are given first priority whose journey in km is maximum. It means waiting list passengers are arranged in descending order according to their distance to be travel. B. Second condition will apply if there will be no waiting list passengers, only then the seat or berth can be booked from counter or through online to the passenger who is willing to start the journey from the next station when the train has to arrive. In Figure 5 explains all the above procedure which is going to happen. Once the DSA Server updates its database it will give the vacant seat information to the PRS server every time it will update. Next, if the waiting list passenger are on the train and the seat are vacant then DSA SERVER will automatically allocate the seat to waiting list passenger otherwise it will be booked from counter or through online. In this way it is possible to allocate seat dynamically during the journey of waiting list passenger. This technology will replace the complex reservation chart that is often carried by the TTEs. Induction of this technology will facilitate travelling ticket examiners to allot vacant seats to short distance passengers. It will enable TTEs to update the status of passengers who are turning up for the journey. After this updating, reservation server will come to know about the seats of absent passengers and will allot those seats to RAC/WL passengers informing them by sending an SMS. After allotting the seats to all the RAC/WL passengers, if some seats still remain vacant then it will be reflected as available seats across railway network and it could be booked by any passenger which is willing to travel from the upcoming station. 1. Revenue of railway is increased. 2. Procurement of tickets by touts is eliminated. 3. It attempts to reserve each and every seat even vacant for one station to next station. 4. It maintains the transparency in berth allocation and makes the ticket checking process fast. This model proposes radical change in train operation and passenger experience. Hand Held Devices are given to TTEs for smooth and faster verification of passengers. QR code is printed on the tickets and this QR code is scanned by HHT devices. In QR code a passenger specific URL is stored, when HHT device encode this URL by Check-in process it redirects to PRS server and fetch stored data to verify the passenger. Check-in process updates the information of all passengers available in the train and let the DSA server to make the seat reserve or vacant. DSA server allot the seats of absent passengers to waitlisted passengers and if still some seats remain vacant then reflect them as available across railway network from where any passenger willing to board on it can book the ticket. Apart from this Checkin, a Check-out and Booking process is also provided to the TTE by this HHT. Check-out process provides the passenger to break his journey at any station by getting his remaining money back and at the same time his vacant seat is provided to a waitlisted passenger. Booking interface provides capability to book the ticket for passengers on board. These technology inclusions in the railway bring transparency and reduce the activities of touts at peak seasons. Yu-Hsan Chang, Chung-Hua Chu and Ming-Syen Chen, A General Scheme for Extracting QR Code from a non-uniform background in Camera Phones and Applications, Ninth IEEE International Symposium on Multimedia 2007. Jerry Zeyu Gao, “Understanding 2D-BarCode Technology and Application in M-Commerce-Design and Implementation of A 2D Barcode Processing Solution”, IEEE 31st Annual International Computer Software and Application Conference 2007.